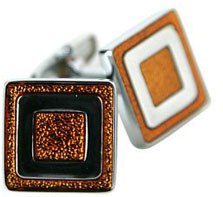 These orange enamel cufflinks are light and dark for maximum versatility. The orange stripes glow and shimmer thanks to a unique reflective enamel compound used. It gives the final piece a shimmering and almost fiery appearance. The product stands up to use better than competitors and continues looking nice through many uses. The set is something that you'll hold onto and will become an integral part of your own personal cufflink collection. If you're not looking for an orange addition to your own set, you could make someone else's day by giving away this cufflink set to someone else instead. I love the orange used in these cufflinks. They are very interesting to look at. Though the design is simple, the orange gives it a certain quality that it allows it to stand out.